In my last post I finished off with some reservations about Boyarin’s interpretation of the two heavenly figures in Daniel 7 as two deities. This post lets Boyarin explain a little more what he thinks is going on here. We have on the one hand the two figures, one like a son of man and the other an Ancient of Days, in heaven. Thrones are set for both. The Ancient of Days is clearly God; yet the one like a son of man enters upon the clouds — an evident sign that he is also a divinity. Against this view stands the continuation of the story in Daniel 7. The one like the son of man appears in the train of four symbolic beasts that represent gentile kingdoms. The vision ends — after the appearance of the one like the son of man — with the downfall of those kingdoms and the rise of a kingdom of the holy people. From this perspective it seems clear that the one like the son of man must be symbolic after all. “Daniel Boyarin,” a prominent conservative rabbi confided to me not long ago, “is one of the two or three greatest rabbinic scholars in the world,” and — dropping his voice a notch — “possibly even the greatest.” The observation was given in confidence because, quite clearly, it troubled the rabbi to think that someone with Boyarin’s views might have truly learned Talmudic grounds for them. As a Christian, let me confide that his views can be equally troubling for Christians who appreciate the equally grounded originality of his reading of our New Testament. . . . .
13 “In my vision at night I looked, and there before me was one like a son of man [a human being] coming with the clouds of heaven. He approached the Ancient of Days and was led into his presence. 14 He was given authority, glory and sovereign power; all nations and peoples of every language worshiped him. His dominion is an everlasting dominion that will not pass away, and his kingdom is one that will never be destroyed. So we have two figures here: an old one and another with the appearance of a young human being. 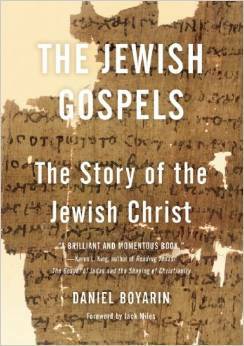 This post outlines the way Jewish ideas about God appear to have developed until they found a new form in the Christian Messiah, the heavenly Son of Man. I base it on a range of scholarly articles and books (including Black, Boyarin, Erho, Fossum, Knibb, Rowland, Wolfson) but will not reference each detail in this overview. Let’s start with the visions of God on his throne in 1 Kings 22:19-22 and Isaiah 6:1-8. In the Kings passage the prophet Micaiah tells king Ahab of a vision he had of the Yahweh sitting on his throne in heaven. In this vision God commissioned an evil spirit to go and inspire false prophets to tell lies and lure the wicked king to his doom. The significant detail for our purposes here, though, is that Yahweh himself ordered the commissioning of the prophets through a lower angel. One angel from among the multitudes of angels volunteered to carry out God’s request. So God clearly acts from above and without equal. The second passage tells us of Isaiah’s vision of God on this throne, but this time the throne is in the Temple — on earth. This time God is accompanied by a presumably higher order of angel called seraphim. Again God is high above and has no equal. 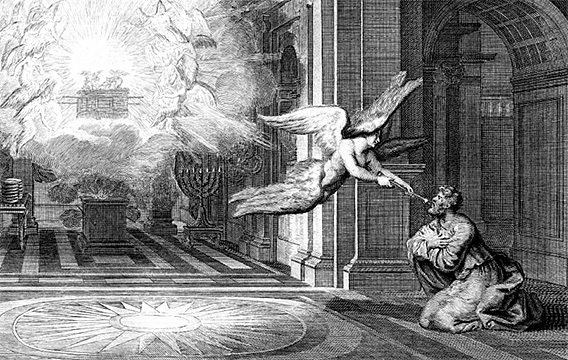 A seraphim approaches Isaiah to place a burning hot coal he has taken from the altar of the temple on his lips and prepare him for God’s call. God then commissions Isaiah to take his message of judgment to Israel. So far we have seen God act exactly as we would expect him to act given our clear monotheistic understanding of how God is supposed to be. Now we come to Ezekiel and suddenly something seems to go slightly askew.